The ancient capital of Moldavia, Iasi (also known as Jassy, in English) had a Jewish community already in the 16th century. For most of the 19th and the 20th century, the Jewish community of Iasi was the second largest in Romania; moreover, the percentage of the Jewish population of Iasi was the highest of any major city in Romania. At its peak around 1900, roughly half of the city’s population was Jewish. At the time there were over one hundred synagogues and prayer houses in Iasi. The Great Synagogue of Iasi is the oldest surviving Jewish prayer house in Romania. It was founded in 1670, reportedly at the initiative of Rabbi Nathan (Nata) ben Moses Hannover (d.1683), author of Yeven Mezulah (“Miry Pit”)(Venice 1653), who was the rabbi of the Jewish community of Iasi in the 1660’s. 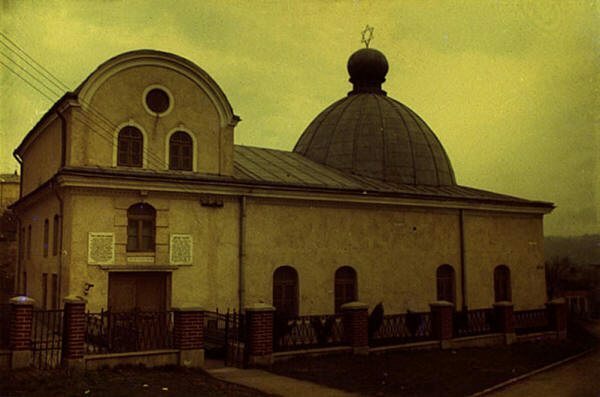 A charter granted to the Jewish community of Iasi in 1666 by Ilias Alexandru, the Prince of Moldavia, confirmed the right of the local Jews to open a school and have a synagogue in their neighbourhood. The synagogue is mentioned in another official document of 1686. Since its foundation in the second half of the 17th century, the Great Synagogue underwent a number of major renovations in 1761, in 1822, and again in 1864. It was restored in the 1970’s. Until the early 19th century it was the only synagogue of the Jewish community of Iasi. 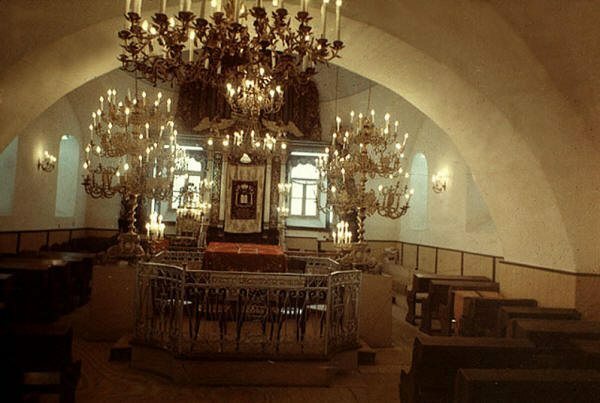 The Synagogue is located on the Synagogues Street (so dubbed because several synagogues were situated there) in the old Jewish neighbourhood of Targu Cucului. Although called the “great”, the size of the synagogue is actually very modest with a total length of 22 meters. Built in an eclectic style with strong late Baroque influences, the building has remained for the most part unchanged since late 18th century. At the exterior the edifice boasts a prominent cupola over its east side while the west end is covered by a half barrel shaped roof. Reminiscent of the fortress type of synagogues found in Poland, the Great Synagogue of Iasi has relatively small windows and doors and 1.20 meters thick stone walls. The floor is located below the street level in keeping with a widespread tradition found in many other synagogues in Central and Eastern Europe. Because Jews were not permitted to build high structures for their prayer houses while on the other hand the Jewish religious tradition requires that synagogues should be the highest buildings in their neighbourhoods, lowering the floor of synagogues represented an ingenious compromise between the two demands by creating an interior that is higher than the exterior elevation of the building. It also serves as a reminder of Psalm 130 (“de profundis”): “Out of the depths have I cried unto Thee, o Lord”. The prayer hall has two groups of two windows on each lateral wall and a ceiling that is divided by a large ark. The women’s section is at the first floor on the west side of the prayer hall. The bimah is located at the center of the prayer hall and has a stand from which the Torah is read. The eastern part of the hall is covered by the 10 meter diameter cupola. All walls are white-painted, with the exception of the eastern one that is covered almost completely by the Holy Ark. The present Holy Ark was renovated in 1866: it is richly decorated with small columns, lavish decorations of carved wooden painted in black, red and green dominated by sculptures of eagles in gilded wood and has gilded wood doors featuring stylized floral motifs. The cupboard in which the Torah scrolls are kept is covered by a red velvet parochet (curtain) with golden silk trimmings on the margins and a representation of the tablets of Law with a crown and two lions at the center. The interior is illuminated by imposing chandeliers. The Great Synagogue continues to serve the dwindling Jewish community of Iasi. It has been recognized as a historical monument.